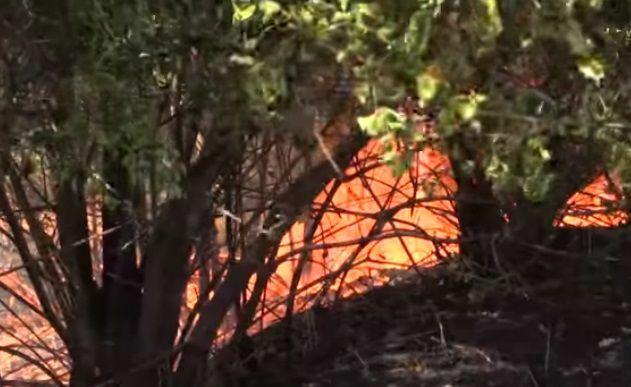 Russian-backed militants in Donbas are deliberately setting fire to the fields and forest areas on the line of demarcation in order to push back the Ukrainian forces, said the speaker for the Ministry of Defense on ATO, Oleksandr Motuzyanyk. "The enemy continues to widely use incendiary ammunition, resorting to the scorched earth tactics. The militants intentionally use this type of ammo, setting fire to the fields and forest belts on the line of demarcation in order to force the units of the ATO forces out of their positions," Motuzianyk told a Kyiv briefing on Saturday. In the last few days alone, such incidents were reported near Zaitseve, Katerynivka, Maryinka, Novotoshkivske and Verkhniotoretske. The official noted that the Ukrainian troops made every effort to extinguish these fires, often with a risk to their lives. Read alsoATO update: hottest spot in Avdiyivka’s industrial zone, 3 WIA reportedMotuzyanyk added that such enemy tactics also affected civilians in the area. On Thursday, as a result of the incendiary ammo hitting one of Zaitseve’s residential areas, a fire broke out in several houses. Motuzyanyk also confirmed that over the past day, as a result of fighting three soldiers of the Armed Forces of Ukraine were wounded.